Starting in Salina we headed north with an initial target of Red Cloud, NE. As we got up there, we decided to go farther west to Holdrege, NE. We got there and stopped for lunch, waiting for the explosion that was obviously going to happen based on the data we were getting. The guests actually got kind of impatient as we sat there baking in the mid-80's temps, with dew points around 70. When initiation occurred, the storms went severe instantly. 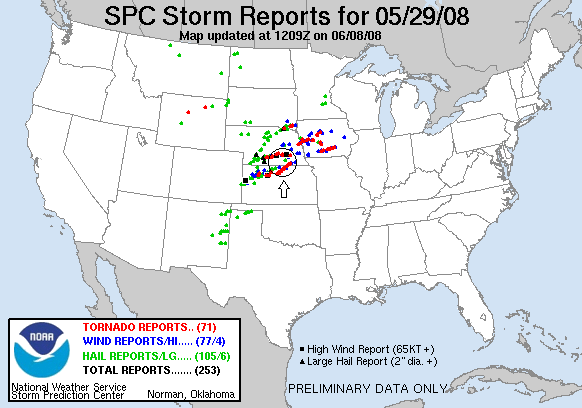 There were two groups of storms on the day, one that ended up along I-80 in Nebraska, and a second one down in Kansas. We intercepted our first storm west of Elwood, stopping there and waiting for the mesocyclone to come to us. It was big and well defined, but a little high based and raggedy. We stayed there as long as we could, then followed the storm to the east side of Elwood. Here the wall cloud really wrapped up and appeared to have a good chance of tornadoing right in front of us. 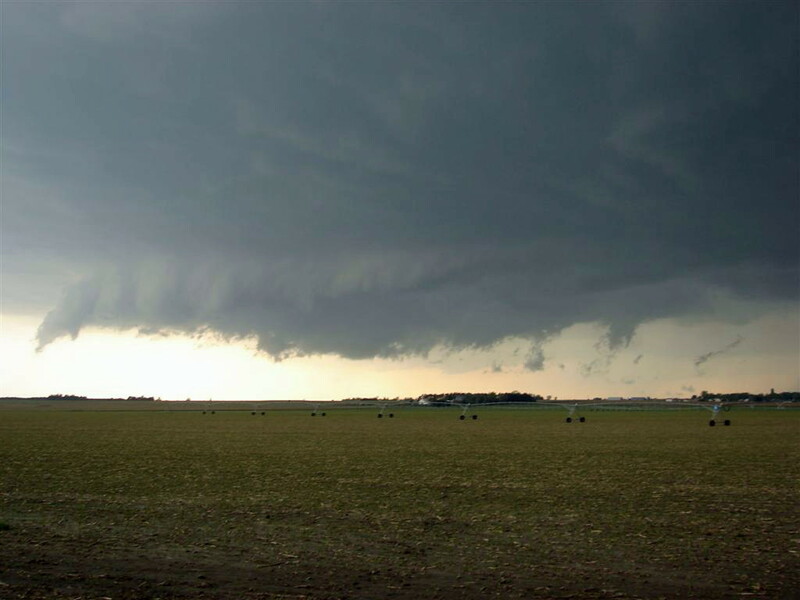 It got more or less on top of us so we headed east again, stair-stepping north and east on county roads (mostly gravel), passing through Bertrand and Loomis, trying to stay up with the wall cloud, which soon was a monster low-hanging block wall cloud. RFD wrapped around and kicked up a ton to dirt. We finally headed north on Rt. 44 towards Kearney with a monster rain wrapped wall cloud possibly producing a tornado to our west. I noted a couple of gustnadoes to our southwest as this was going on, and Roger thought he could pick out an elephant trunk tornado in the rain. As we got to Kearney it was clearer: the meso was a spinning soda can with a rain wrapped cone tornado that you could occasionally catch a glimpse of. As we entered town from the south we saw numerous power flashes as the tornado sirens blared. We pulled over on the ramp for I-80 and since I was in the navigator seat of my van at the time I stood on the door and took video over the roof of the van, and my lucky tornado hat got blown off my head and I had to run and get it! We later found out that significant damage was done to the north side of town, including a coal train being flipped over, several buildings destroyed, power lines down and power out in the town, and possibly injuries. We stayed ahead of the storm all the way to Shelton, then decided to dive south towards Hastings and check out the tail end of the line segment, passing near another big meso that was on the southern tip of the hook echo as we moved south. We soon decided to let that storm go and head south since we needed to be back in Oklahoma City that night. 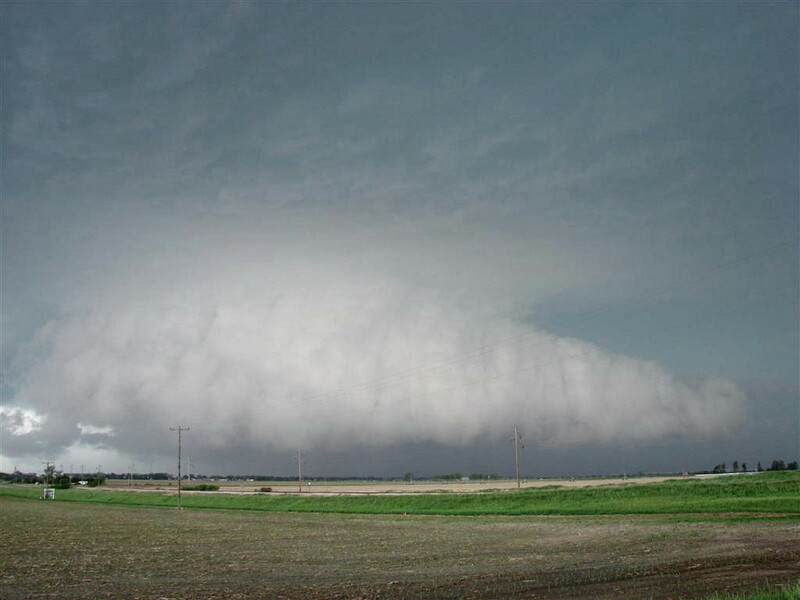 The northern group of storms went on to hit Grand Island, Aurora, and Fairbury, doing significant damage and closing portions of I-80 in Nebraska. As we charged south we weaved through a big chaser gaggle including the DOW and the rest of the Discovery Channel circus. There were two storms in line that we were going after that had already produced tornadoes near Hoxie, KS. As we crossed the state line, it was a race to Mankato, KS to beat the core of the first storm there. We skirted the front flank core of the storm, but it was falling apart while we closed on it, so we decided to drop down to Beloit, KS and go for the second storm which had an unbelievable hook echo on radar. We charged west towards Tipton, cutting through the southern edge of the core. As we came through I was a little confused. The meso looked really close, but on radar it was apparently still quite far away. Then I realized: The meso was HUGE!! The largest, meanest looking mesocyclone I think I've ever seen. As soon as I figured it out, I knew we were in for a violent tornado. We closed to a cross-roads south of Glen Elder and pulled over. We were there for only a minute or two when the wall cloud dropped a massive multi-vortex tornado right in front of us and coming our way. It was AMAZING! The contrast with it getting towards dark but with enough light to make it easy to see made it look really ominous. It was only about a mile or two away when it formed and it was a surreal sight with multiple suction vortices scuttling this way and that and one after another satellite tornado forming to the left, to the right, everywhere and all different forms and sizes. Meanwhile numerous CG lightning strikes were occurring right near the tornado. I really have no idea how many tornadoes I saw over that 20 or so minutes but it had to be at least 5 or 6. Pretty soon the tornado was only 300-400 yards or so from us so we had to run for it as the wind suddenly started pulling violently towards the tornado. There were a bunch of chasers around there and the traffic jam made for a pretty tense escape. 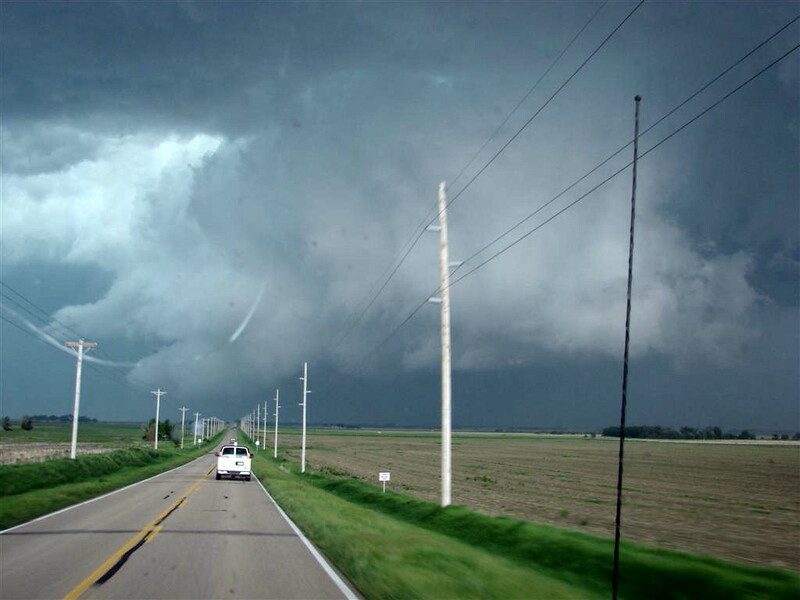 We charged east and stopped briefly, then ran off again and I watched an elephant trunk tornado in my rear view mirror flying around the north side of the main tornado looking kind of like the wizard of oz tornado skidding sideways like it did in the movie. The tornado crossed the road and we were able to stop and jump out and film the tornadoes for several minutes as they churned across the fields north of us, throwing up a nice dirt debris cloud. While we were there, the TIV and it's apparent evil-twin black TIV went charging off to make an intercept. We ended up charging north and stair-stepping on dirt roads that were so curvy they were like a slalom course. It looked like the tornado had solidified into a big cone or wedge off to our north as it became rain wrapped and got away from us. We later heard that it had skirted the town of Glen Elder, doing some damage, but then hit the little town of Jewell very hard, apparently with some injuries. If you look at the storm reports for the day, you'll see that the storms cut two swaths of damage almost the entire length of both Kansas and Nebraska. We finally broke off and headed back to Oklahoma City, ending the tour. The 20 minutes around the multi-vortex tornado may have been the most exciting chase moments I've had in my 8 years at it. Mileage or the day: 867 miles. Tour total: 5189 miles. A very promising day. We intercept our first storm near Elwood, NE, with an already well developed lowering. The storm tried to cycle up wall clouds several times but had trouble getting organized. Now near Bertrand, a caterpillar looking tail cloud develops very low to the ground. We chase / get chased all the way to Axtell on Rte. 44 before turning north towards Kearney. Here we are heading toward the wall cloud of the storm that would eventually drop a damaging tornado on Kearney. Just south of Kearney we observed numerous power flashes associated with a strong tornado embedded in the rain in this photo. The tornado was strong enough that it derailed a coal train. 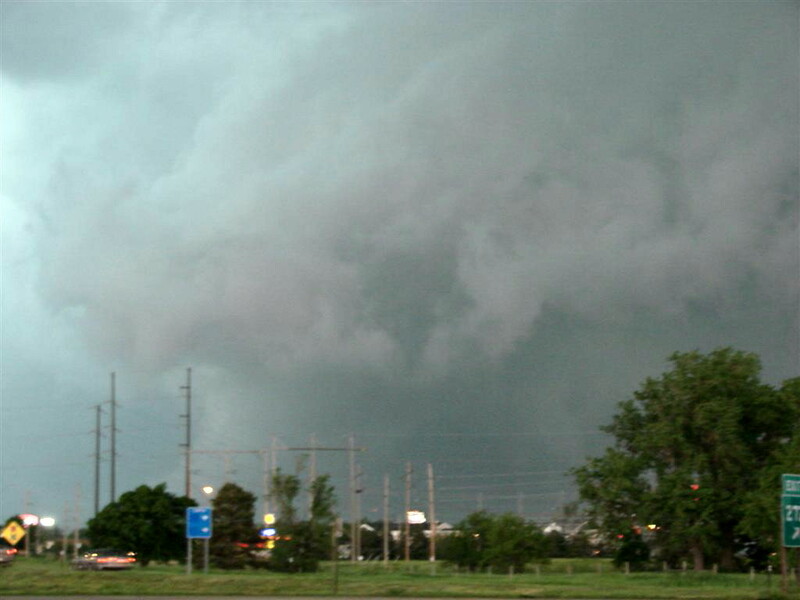 The upper level of the mesocyclone was rotating like a top as the tornado emerges from behind the trees. We headed east while this storm, it's mesocyclone mostly rain wrapped, headed northeast and did a lot of tornadic damage along I-80, closing it in places. 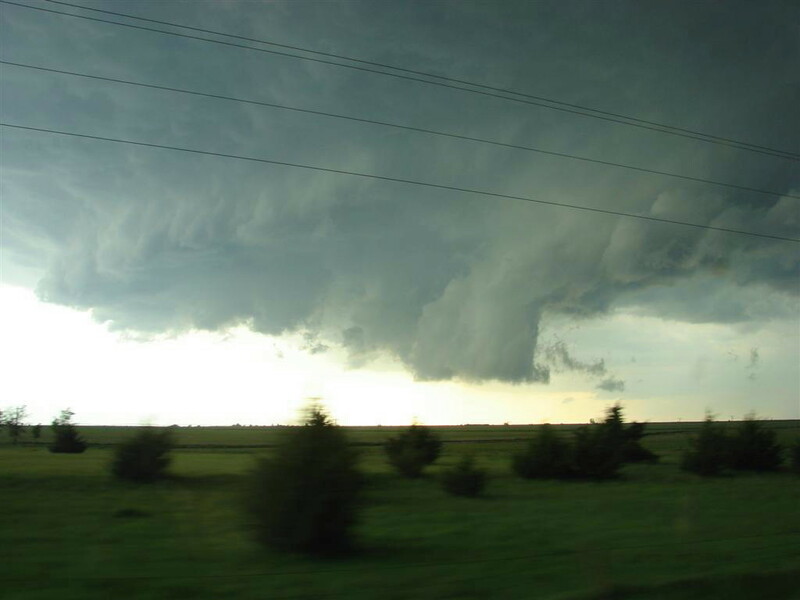 The next sequence of pictures are from the wild Glen Elder, KS tornado we intercepted at the end of the day on day 10. This tornado was coming right at us and dropping satellite tornadoes left and right. It got within 300 yards of us at one point before we had to run for it. The wildest 15 minutes of chasing I've experienced. 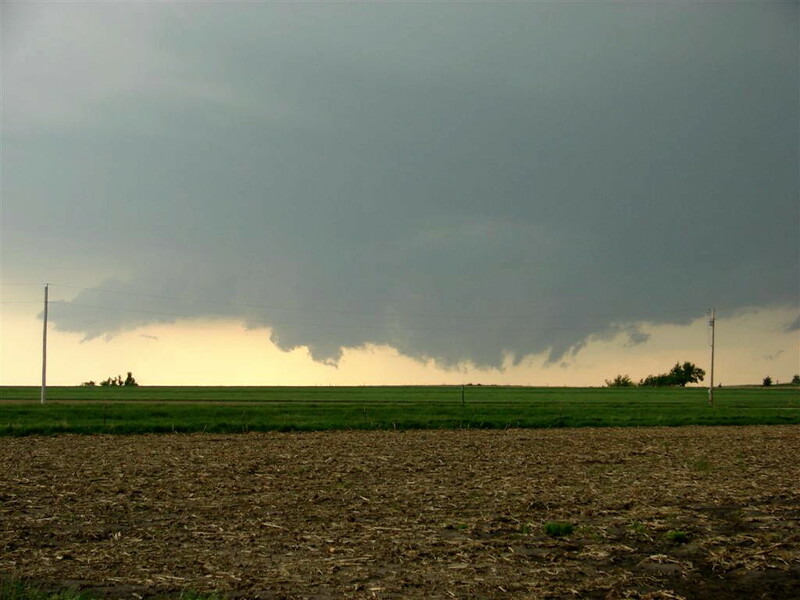 Here is one of the satellite tornadoes as it formed north of the main rotation. Here you can see both tornadoes simultaneously: an elephant truck tornado to the left of the picture, and a landspout on the right side. After we'd stopped and had to run for it twice, the tornado crossed the road and spun through the field directly to our north where we could watch it from less than a mile away safely. You can see the funnels of several separate vortices in this shot. The tornado went on to do significant damage to the town of Jewell. The tornado crosses the north road as the group watches.